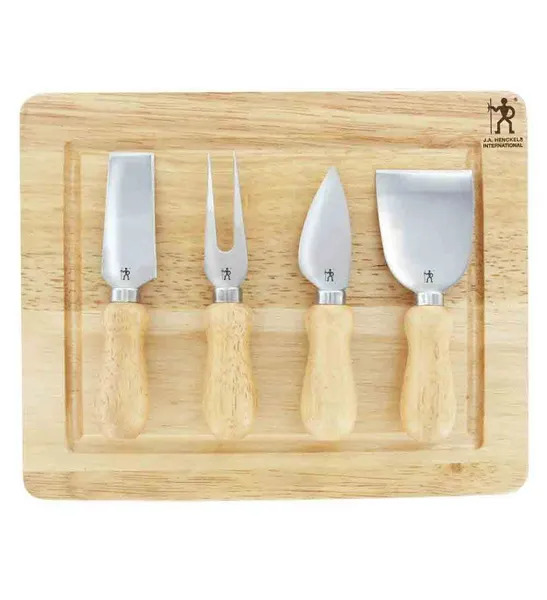 While JA Henckels offers a wide range of cheese knives (among its other famous kitchen knife sets, of course), this 5-piece set from its International line is among the most popular. Not surprisingly, it’s among the most affordable too. But that doesn’t come with a compromise on the quality. In fact, I think it’s the best value JA Henckels cheese knife set you can get. You can’t beat that price for the moniker and the quality! Since it doesn’t come with any instructions, let’s quickly go through the which-knife-is-for-what. Second from right, the knife with a pointed blade, is called the parmesan knife. The name tells it all: you use this knife to split or break a parmesan cheese. It also works on other semi-hard or semi-soft cheeses, such as chevre, havarti, Muenster, Camembert, feta, havarti, or Monterey Jack. The knife is sometimes used for spreading the cheese onto a hard food. The narrow plane knife, the one with a rectangular blade, is capable of cutting semi-hard cheeses. (Comte, cheddar, Swiss, Gouda, or Roquefort). It’s very handy too when you need something to help spread the cheese onto hard or semi-hard foods. Since this knife has 3 sharp edges, you can cut from either of the side, or use it as a mini chisel. Finally, the duo-pronged fork is useful for serving small pieces or cubes of cheese. If you’re a group of people eating more than one cheese with very different flavors at the same time and don’t want to mix them, you may want to use more than one of this.